Claims processing, a core function in the insurance value chain, is witnessing new trends that are influencing claims management and enhancing the customer experience. Today, the market is replete with a number of end-to-end claims management solutions that help insurers achieve regulatory compliance, detect fraudulent and invalid claims, and optimize processes to support a streamlined claims experience. These solutions are capable of providing real-time analysis of claims processes, enabling insurers to gain actionable insights that support decision-making. With an approach built on Key Performance Indicators (KPIs), the claims management solutions are empowering insurance companies to enhance claims efficiency, monitor, and measure overall improvement. Importantly, the companies are implementing advanced fraud detection technologies to recognize false claims. Today’s end-to-end solutions use a blend of technologies including predictive analysis, data mining, rules-based engines, and activity analysis to identify scams— giving insurers comprehensive visibility into claims processes. By transforming the existing processes, these solutions help reduce costs, enhance customer satisfaction, and boost fraud detection. 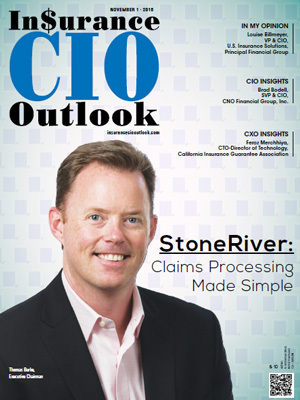 To help CIOs and CFOs find the right claims processing and management solution for their enterprise, a team of prominent CEOs, CIOs, and VCs along with Insurance CIO Outlook’s editorial board has evaluated the best players in the space. The companies featured here demonstrate an ability to develop innovative technologies combined with outstanding customer service. In our selection, we looked at the vendor’s capability to fulfill the burning need for cost-effective and flexible claims processing solutions that will add value to the insurance landscape. 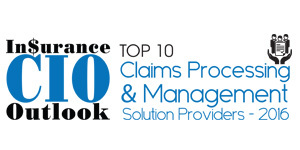 We present to you Top 10 Claims Processing and Management Solution Providers 2016.